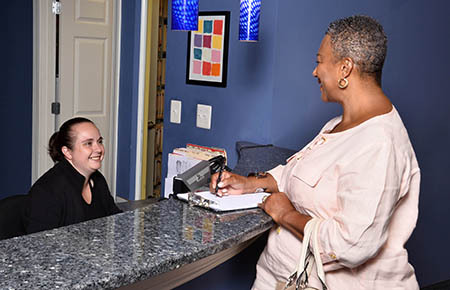 At Anne Arundel Eye Center, we are committed to making our eye care services accessible to everyone. In addition to accepting all major insurances, we will do our best to work with your financial needs. We also strive to make our billing process as simple and streamlined as possible. Anne Arundel Eye Center accepts all types of insurances including: Aetna, BlueCross Blue Shield (BCBS), Cigna, Maryland Physician Care (MCO), Medicaid, Medicare and United Healthcare, to name a few. Click here to see a list of insurances accepted. If you do not see your insurance carrier included, please contact our office to see about having it added or to provide you with the appropriate statement to submit to your insurance company. For questions, please call us at (410) 224-2010 or Email. Anne Arundel Eye Center is also a CareCredit provider. Directions to Anne Arundel Eye Center Annapolis Office or click here to download. "Thank you for the excellent care that you have provided to me. I would also like to compliment you on your outstanding staff! Everyone in your office and at the surgery center provides the type of client/patient service that is almost non-existent these days. I worked with many large businesses here and in England and I never was exposed to another "perfect" environment until I became a patient of yours! It is so wonderful to know that client/customer service really is alive and well."